Notice: Toketa vol.3 will be published. See here. 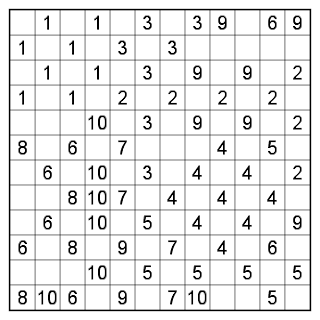 Hitori is the puzzle appeared in Nikoli in 1990. 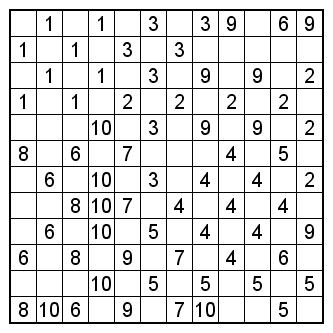 Classical Hitori was only searching puzzle; looking for certain starting points, and searching the row/column of unblackened cells. That was all. It is often said that Hitori is not in favor because of unnecessary clue cells, but I think this is not bad when regarded as searching puzzle. On the contrary, modern Hitori is rather logical. Especially, in harder puzzle, we need to consider global connectivity, and I love Hitori with this logical deepness. Here, the authors tend to try to make searching easier, and unnecessary clues can actually be unnecessary. Most Hitori I have solved in contests are classical searching ones, where noise clues are valid. I want to solve logical Hitori more. By the way, Hitori Round in Logic Masters 2014 was great. It suggests some ways to resolve problems about Hitori.